Cookbook #234: Sunset Cook Book for Entertaining, the Editors fo Sunset Books and Sunset Magazine, Lane Books, Menlo Park, California, 1971. Entertaining, not my forté! I’m a bit too much of an introvert so I’ve never practiced it a lot. Sort of shy. And don’t get me wrong, I love cooking for people, but when it comes to presentation, I am lacking in ability and (desire). When company comes over (usually family), I want something delicious to serve and I don’t want diners getting full on appetizers. Save room for dessert! I always thought that Sunset Cook Book for Entertaining was all about “appetizers” and I have only rarely looked through it. I am not sure even where this book came from, and it has no markings in it as clues. I pick it up and wonder how in the world I am going to be able to cook something from this cookbook, since we are on our January low-carb eating plan. 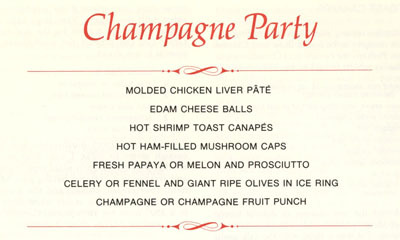 The first chapter is, indeed, appetizers. But hmmm, I see some good ideas, and only a few bad ideas. Like, no cream cheese-sour cream dips! (bad idea). The good ideas: Marinated Mushrooms, Ginger-Minted Carrots, wine-poached scallops (Coquilles St. Jacques), Quiche Lorraine Appetizers, and Hawaiian Beef Sticks. 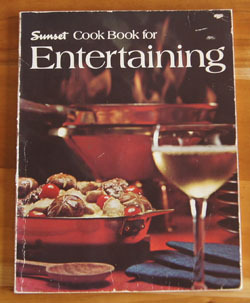 Sunset Cook Book for Entertaining also suggests having “sit-down” appetizers, where guests sit down to a first course of these goodies. I can see making that a meal, like tapas. Maybe this is not a cookbook to be recycled. Next is Soups and Salads – the traditional beginning of a meal. The soup and salad recipes are all easy with a few interesting flavor twists. 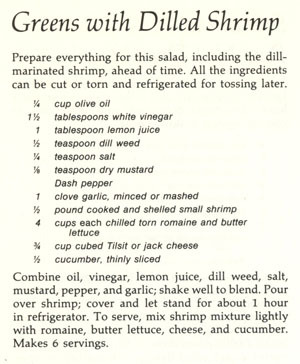 I like the Greens with Dilled Shrimp, largely, probably, because of our low-carbed-ness moment. Distinctive Entrees begins: “The entree is the most important part of a meal, and the deciding factor in all the other things you serve before, with, or after.” Let’s see what they have. 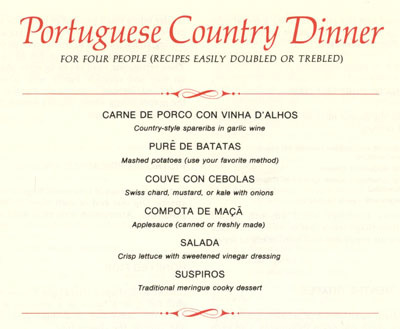 Most of the recipes sound good, like Beef Burgundy, Veal Veronique, and Giant Beef-Lobster Kebabs. 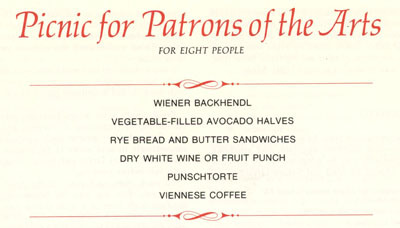 But what I like about this chapter’s recipes is that almost each one requires very little last minute prep from the cook: “The foremost consideration in the selection of these entrees has been whether they are practical for entertaining. Nearly all of these dishes may be made partially or entirely ahead; many may be frozen.” A few of the recipes look very involved but I might find them fun: Danish Chicken and Meatblls au Gratin, for instance, calls for veal meatballs, chicken breasts, and sweetbreads, all cooked and assembled in a rich sauce ahead of time and simply heated briefly just before serving. “Pheasant-in-a-Bag” is an example of one of the more unusual dishes in this chapter. 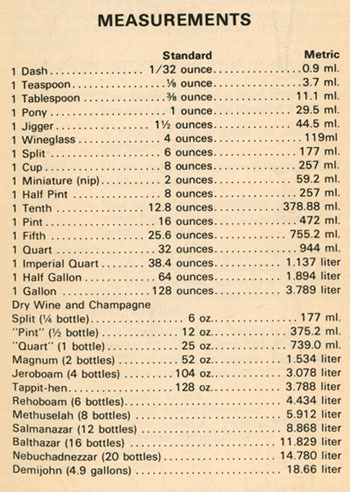 I note a recipe for Turkey Tetrazzini, one I’ve come across several times in cookbooks of this era, and one that I have explored before (Encyclopedia of Cookery, Vol. 11, All-Time Favorite Recipes, and All-Time Favorite Casserole Recipes). 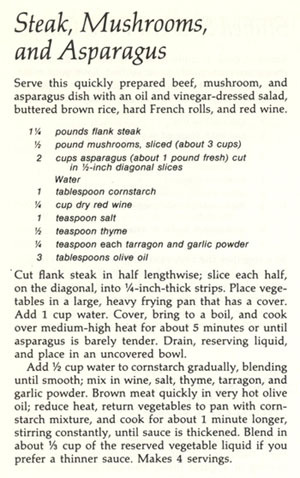 An easy last-minute dish is “Steak, Mushrooms, and Asparagus”, a dish I plan to make for us soon. I find throughout the chapters a series of “helpful hints”. For instance, soup garnish ideas, folded napkins, flavored butter seasonings, coffees from around the world, cooking with wine, the art of the small dinner party, and a guide to serving cheeses. Accompaniments and Side Dishes has recipes for cooked vegetables (Green Beans, Mediterranean Style), potatoes (Skillet Potatoes Anna, Pecan-Topped Sweet Potatoes), rice (Risotto), bulgur (Wheat Pilaf with Peas and Lemon), pasta (Parsley Spaghetti), and breads (Buttery Pan Rolls, Pine Nut Sticks, Honey-Pecan Cornbread Sticks, Cheesy Spoonbread). Distinguished Desserts is next. If you’ve been paying attention, you know that I find myself drooling over most of these recipes, but am holding back on cooking them because they are calorie-laden (and carb-laden!). These tempting recipes are for tortes and souffles, puddings and pies, sherberts and glacés (one with flaming strawberry sauce), and cakes and cookies. Most of the recipes in this chapter are a little different, a little fancier than my recipes for simple chocolate cakes and such. But none are for me today. I keep reading. 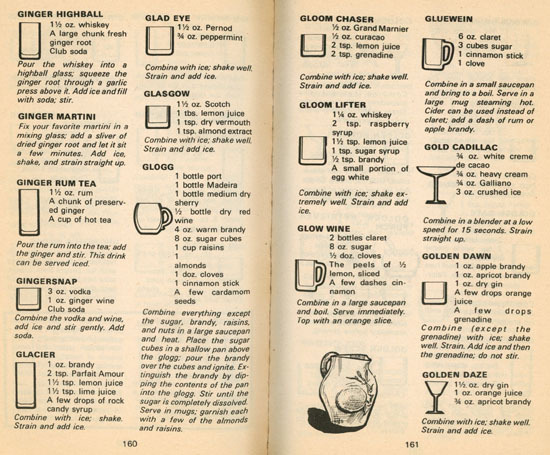 Hot and Cold Drinks recipes include hot drinks (Mexican chocolate, wassail bowl), cold drinks (citrus punch, yogurt coolers, fizzes) and alcoholic drinks (sangria, glögg, milk punch with brandy, Kahlua frost). The final chapter is Special Meals for Special Occasions.This section combines new recipes and references to previous recipes for many dinner party menus. 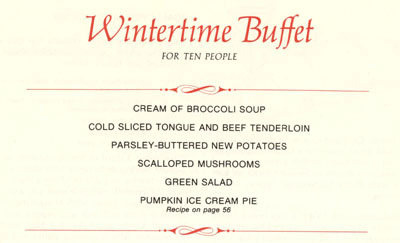 I’d say there are tons of ideas in this chapter for “hostesses” (including a good version of Beef Fondue). Different, unusual, and tasty ideas at that. I’d like to go to one of these dinner parties! But make them? Doubt I will. I’ve scanned in several of the menus from this chapter. 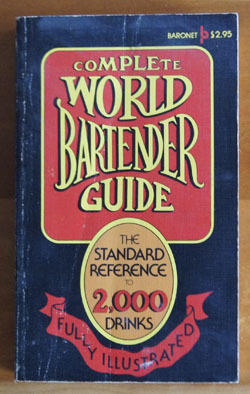 They show the breadth of menus and recipes included in this book. 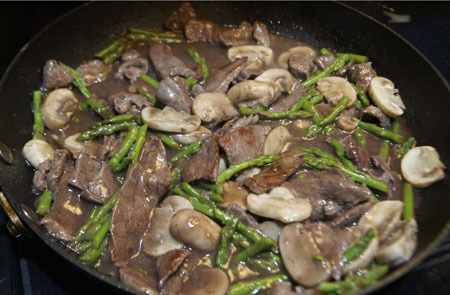 For this blog, I decide to make Steak, Mushrooms, and Asparagus from the Entrees chapter. This is a low-carb recipe, by the way! The suggested side dish carb, brown rice, is a good low-glycemic index grain choice, but I will use quinoa instead. I’ve adjusted the herbs and thickening agent (cornstarch) up a bit to our own tastes, and made twice the amount of sauce. Cut the flank steak on the diagonal into 1/4-inch strips. Place the mushrooms and asparagus in a frying pan. Add 3/4 cup water, bring to a boil, and cook over medium-high heat for about 5 minutes, until the asparagus is barely tender. Drain, reserving cooking liquid, and set aside. Mix 1/2 cup water with the 1 tablespoon cornstarch, then add the wine, salt, thyme, tarragon, and garlic powder. Set aside. Brown the meat quickly in very hot olive oil; reduce heat, return vegetables to pan, add the cornstarch mixture, and cook for about 1 minute longer, stirring constantly, until sauce is thickened. Blend in some of the reserved vegetable liquid if you prefer a thinner sauce. I liked this a lot, but all I got was a “pretty good” from my hubby. He is used to this type of meal with a lot of soy sauce; I, on the other hand, appreciated the subtle red wine sauce. I am not an asparagus fan, but the asparagus I found at the store was very small and young, and cut into the small pieces, I found it to be quite good. I also made the Dilled Shrimp with greens another day last week. It was good, but the shrimp I bought were not good – they were tiny and tough. I’m sure it would be excellent with good shrimp. I have decided to keep this cookbook. Online, I find that it is still for sale (used) for several dollars a copy. And I found one favorable review – so I know I am not alone in appreciating this book. I have always liked the type of Southwestern cuisine that Sunset magazine promotes. Another “found” cookbook, right on my shelves! 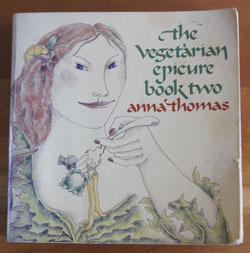 Cookbook #233: The Vegetarian Epicure Book Two, Anna Thomas, Alfred A. Knopf, NY, 1978. The Vegetarian Epicure Book Two is pleasantly illustrated and is printed on solid, rough paper – such a good tactile touch. Anna Thomas is a friendly author, and the recipes straightforward. I bought this cookbook for myself, and I’m sure that I leafed through it at the store and was intrigued by the look of the book and the variety of recipes. Who is Anna Thomas? I find that she is alive and kicking, and has a website and a wikipedia entry. She is the author of five books, and my book, The Vegetarian Epicure Book Two, is still being printed, and in the same paperback format. This is pretty amazing. She is a popular food writer, and contributes to several periodicals. But perhaps more interesting than that, she studied filmmaking in school, and is a screenwriter and producer! The Haunting of M, El Norte, and Mi Familia are among the films she produced. This book is not for vegetarians only. “It is for anyone who can enjoy foods like fettucine alfredo, pea soup with dumplings, fondue, pimiento and olive quiche, tomatoes filled with hearts of palm, Liptauer cheese, wild mushroom souffle, Caesar salad, and frozen strawberry mousse.” I am in that group! Yes, we all get hungry again! Anna Thomas has made me smile. I turn the next pages ready for a little adventure, a little more acceptance of a dinner without meat. 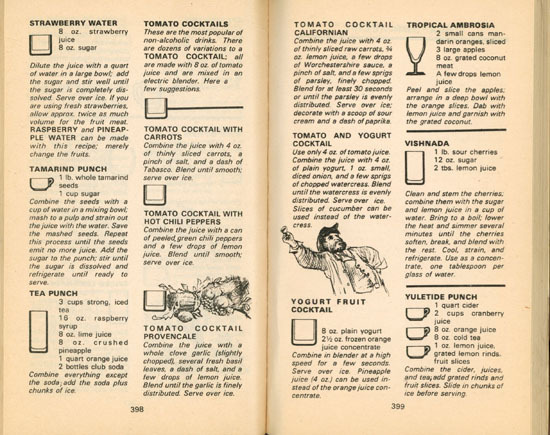 A menu section precedes the recipes. 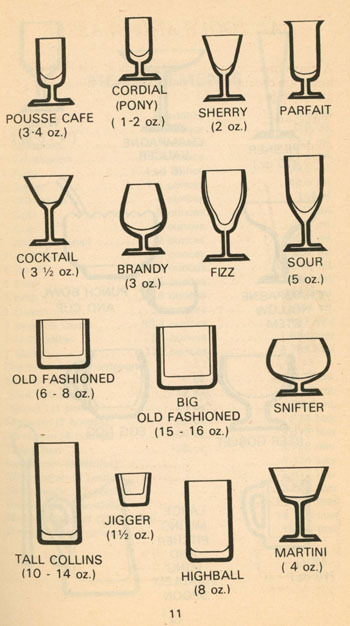 This is really helpful for me. 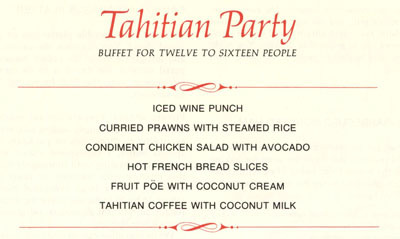 Sure, I have a vegetarian main dish or two in my repertoire, but a whole meal for guests? I would need some help. “Breads” is the first recipe chapter. Well if you know me, you know that bread is one of my favorite foods. Her breads vary from whole wheat to white, yeast to quick breads. I’ve tried An Easy Herb Bread on page 35.This is a yeast bread, but can be ready in two hours. The herbs are basil, oregano, and thyme, with garlic and egg in the dough – it makes a nice bread to accompany soups and the like. Oatmeal Raisin Bread is interesting because it is made from cooked oatmeal – I usually just add dry oats to a batter. It also has honey, whole wheat flour, and wheat germ. Beer Bread has whole wheat berries, molasses, beer, white and rye flours, and a hint of fennel seed. Pumpkin Corn Bread is a quick bread with whole wheat flour, spices, corn meal, and pumpkin. Chapitis, Puris, and Sweet Finnish Rusks recipes reflect Anna’s travels. I might try her muffins: Corn and Rye Muffins, Four-Grain Muffins, and Oatmeal Muffins. “Soups” begins with recipes for vegetable broths. I’ve made non-meat stocks before, but only a couple times, and I don’t have the best recipe. The Vegetarian Epicure Book Two has two variations on vegetable broth recipes, and also a garlic broth and a potato peel broth. 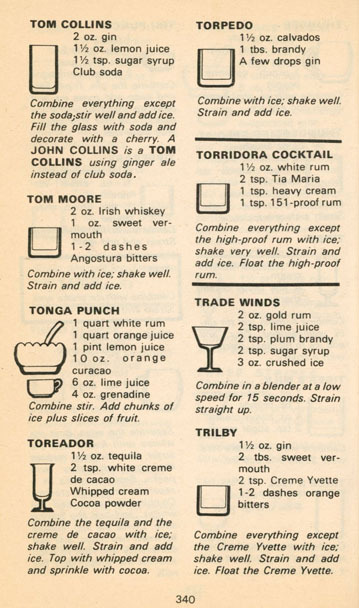 These recipes look so interesting – so chemistry-lab-experiment-style interesting – that I think I’d have fun trying them. I also like these soup recipes: Tortilla Soup Tlaxcalteca, Pasta e Fagioli (pasta and bean soup), and Creamed Fresh Pea Soup with Dumplings. The “Sauces and Salad Dressings” chapter has good recipes, but none strike me today as better than what I have in my repertoire. “Eggs, Souffles, Omelets” is next. Souffles tend to have a lot of calories so I stay away from them, although she has some interesting ones. I like the chapter on “Salads and Cold Vegetables”. Marinated Leeks, Garbanzo Bean Salad, Lima Bean Salad, and White Bean Salad tempt me. Potato Salad Tzapanos is cooked carrots and potatoes with dill and garlic. Gnocchi Salad! I love gnocchi – and this one has fresh peas in it. 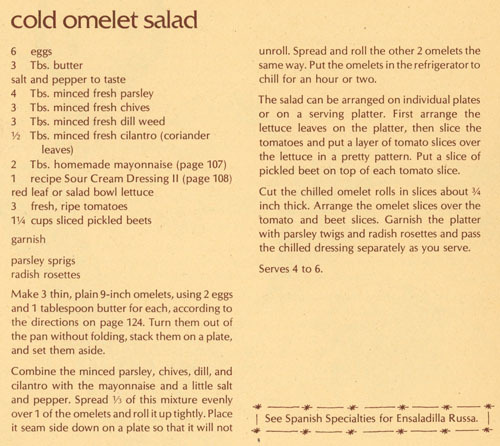 And the “Cold Omelet Salad” would be tasty when we are on a low-carb eating plan. “Stews, Casseroles, Hot Vegetable Dishes” employs a lot of vegetables that I have to admit I don’t really like, such as eggplant, brussels sprouts, turnips, and cooked cabbage. But I might try the Red Cabbage with Apples and the Mushrooms on Toast (marinated and then cooked). The Stuffed Potato Pancakes begin with pancakes made with eggs, potatoes, flour, cream, and parsley. These cook up as “crepes” rather than my usual flat potato pancakes. They are filled with a wild mushroom, onion, celery, and walnut mixture, then sauced with hot paprika sauce that is hot with both spice and temperature. I think I’d really like these. Anna Thomas states that “Croquettes, Pâtés, Cheeses” are “hard to classify, but only because they’re so well suited to so many purposes”. Honestly, I doubt they would fit into my repertoire, because I don’t “entertain” very much. Plus I can’t get hubby to enjoy white beans, much less white beans chopped up into a molded appetizer. And the croquettes are deep fried, and so pretty much off the list of foods that we eat (although I am sure they are good). I did note the Mushroom Pâté II and White Bean Pâté, though, and maybe I’ll make them for a family get together. The mushroom pâté has hoop cheese in it. And Noodle Kugel, a slightly sweet hot noodle pudding dish might be just the recipe I have tried to find for years to duplicate a dish a college friend made. “Savory Pastries: Quiches, Pizzas, Pierogi” recipes are good, but few catch my interest. The quiches are high calorie and I already have tons of pizza recipes. 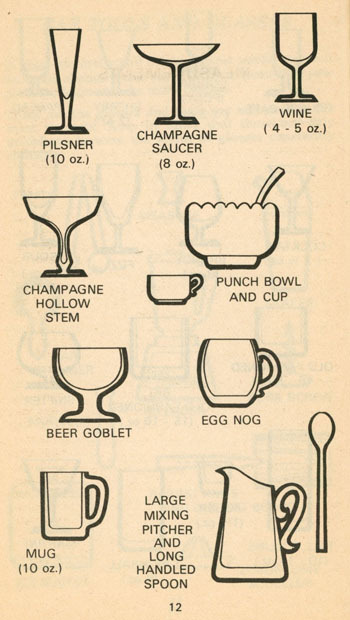 I would like to make the Yeast Pierogi, but doubt I will – they are a lot of work. I made notes on the basic crepes recipe in “Crepes”. 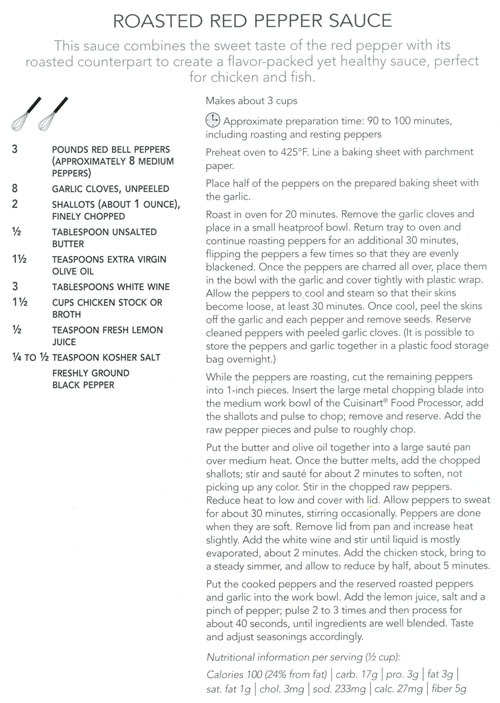 The Parmesan Crepes recipe jogs my brain: I think I was looking for this recipe a long time ago, for use in Pizza Crepes with Garlicky Marinara Sauce, a recipe clipped from a magazine ages ago. I also like the Crepes with Feta Cheese – a folded rather than rolled crepe. In “Italian Pastas, Vegetables, and Fritattas”, I like the Fritatta of Zucchini. It would fit into a no-carb diet, as it’s just chopped zucchini, eggs, onions, basil, and a bit of olive oil. The Conchiglie Tutto Giardino (pasta with fresh vegetables, “the whole garden”) has cooked radishes in it. “Spanish Specialties, including Tapas and Tortillas” has several recipes that I noted: spinach enchiladas suizas, Enchiladas Salsa Verde, and Tortitas con Queso (a tapa). 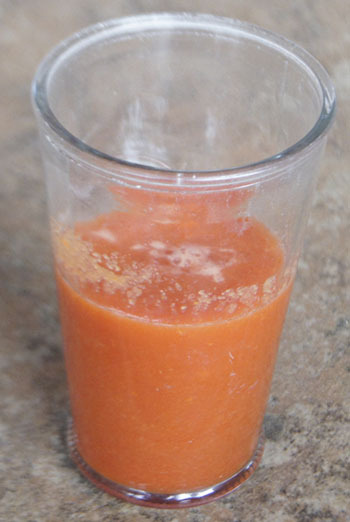 Cantaloupe Water sounds interesting – blended cantaloupe with water and honey! “Indian Foods” I pass by, because hubby really doesn’t like curry. Desserts? Well, I have too many dessert recipes, but I do like a couple of the apple desserts. The Vegetarian Epicure Book Two even has a “Preserves and Relishes” section. Catsup, dill pickles, and chutneys. The last chapter is “Tiny Open-faced Sandwiches”. 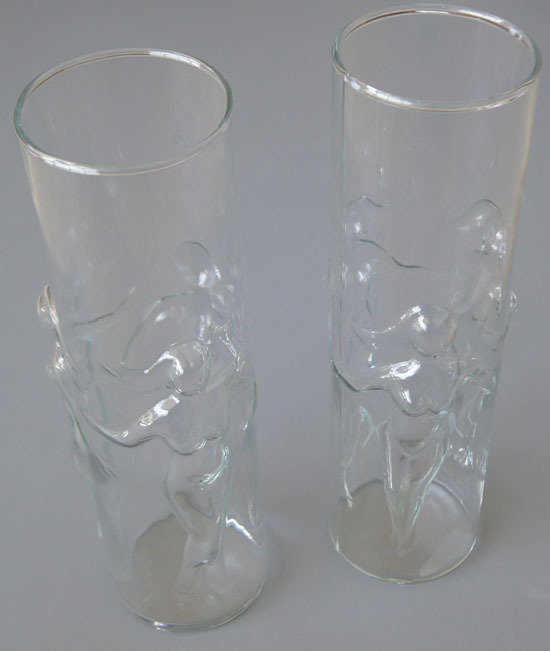 These might be nice for Tapas. I decide to make the Cold Omelet Salad for this blog. Fits in well with our current January low-carb diet. I know this omelet would be very good served over lettuce, tomatoes, and beets, with a sour cream dressing. But I can’t eat beets, and I decided to just make the omelet and cut it into pieces to use as high-protein snacks for us. To make the omelet, I consulted both this book and Julia Child’s Mastering the Art of French Cooking. Crack the 2 eggs into a bowl and mix with a whisk until the eggs are all mixed together. In a large skillet, on medium high heat, melt the butter until it starts to foam and brown. Turn the heat to medium, and pour in the eggs, tilting the pan to cover the bottom. Shake the pan to loosen the bottom. Lightly spread the uncooked egg areas around the top of the omelet so it all gets cooked. After about 30 seconds, the top of the omelet should look almost cooked. 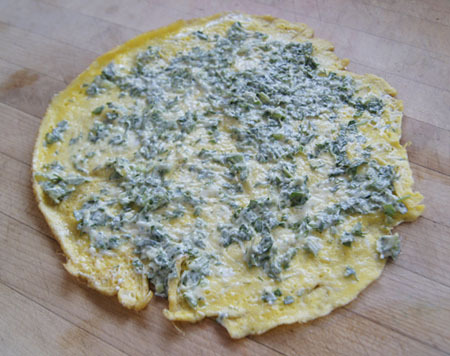 Loosen the edges of the omelet and carefully slide it onto a plate or work surface. Combine the chopped herbs, chives, mayonnaise, and salt and pepper. Carefully spread over the surface of the omelet. Carefully roll the omelet. 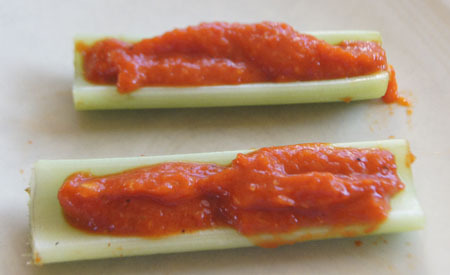 Chill a couple hours, then cut into 3/4-inch pieces to serve as a snack. We enjoyed these as a late-afternoon snack – they are delicious! We both liked them. Wow. When I first opened this book I thought I didn’t like any of the recipes and thought my conclusion would be “recycle”. But I found many, many recipes to try! Glad I found this book again. We all get hungry again! Thank you, Anna Thomas. 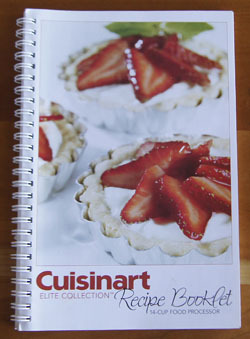 Cookbook #232: Cuisinart Elite Collection, 14-cup Elite Collection, Cuisinart, Conair Corporation, NJ, circa 2010. My current food processor is the 14-cup Elite (I covered my old one in this post). I give this Cuisinart permanent residence on the counter in my kitchen! 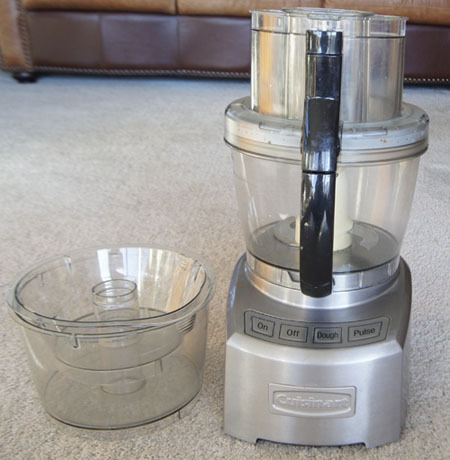 I chose this 14-cup food processor for myself in 2010, when I retired from the University of Colorado. The folks in the Chem Dept took up a collection and gave me a gift card the night of my retirement celebration – and this Cuisinart Elite is what I chose to buy for myself. I look at it with fond memories. The 14-cup Elite comes with 3 bowls: small, medium, and large; a blade for chopping and a blade for dough; and the usual slicing discs and grating discs. The blades and discs fit into a cute Barbie-style plastic storage box. I use the large bowl a lot, and the small one is especially nice when I am preparing food for the two of us. How would I review this Cuisinart, after using it for 8 years? Well, no food processor is perfect. Liquid sometimes leaks from the top, because the rubber gasket does a poor job of sealing the connection between the bowl(s) and the top of the unit. It’s also tricky sometimes to get the lid and feeder in the proper position for the switch to work (sometimes I have to hold the lid down with my hand while chopping). Cheese, especially jack cheese, just doesn’t want to grate in it, it gobs up into chunks. When I grate carrots or any vegetable, big chunks are left on top of the shredding disc. Sure there are 3 bowls, supposedly so you can quickly move through different parts of a recipe, but the blades and discs and the processor lid always have to be rinsed inbetween. If I had a clean-up person following me around, I’d use my Cuisinart a lot more. Often it’s easier to just grab a good knife and chop. But would I choose to live without it? Heck no. It’s my best tool for quantities of chopped vegetables, it’s what I use to make pie crusts, it’s what I use to make hummus, pesto, and salad dressings. As I said, I allow it permanent space on my kitchen counter, and that says a lot. It looks good too. Plus, Cuisinart has excellent support for their products. My food processor and I just have a sort of love-hate relationship. Here are all the recipes I’d like to try: Tartar Sauce, Spinach Pasta Dough, Classic Bruschetta, Caramelized Onion, Steak and Gruyere Quesadillas, Tomato Soup, Shredded Carrot Salad with Honey-Ginger Dressing, Spinach Ravioli, Classic Meatballs, Sweet Potato and Black Bean Empanadas, Stuffed Roasted Peppers, Cherry Crumb Muffins, Chocolate Chip Crumb Cake, and Pound Cake with Pine Nuts and Olive Oil. I decided to make just a half recipe for the two of us. Heat the oven to 425˚. Put half the red peppers and all of the garlic on a parchment-lined baking sheet. Roast it all in oven 20 minutes, remove and save the garlic, then continue roasting the red peppers for 30 more minutes. Turn the peppers occasionally so that they become evenly blackened. When they are charred all over, remove them and immediately seal them in a plastic bag. After about 30 minutes, the peppers will be cool and the skin easy to remove. Peel both the roasted peppers, removing the seeds, and also peel the garlic cloves. Store them together until you are ready to complete the sauce (I left mine overnight in the refrigerator). Put the shallots in a food processor bowl fitted with a chopping blade. Pulse to chop, then remove them and set aside. By hand, chop the remaining 2 red peppers into 1-inch chunks and put these chunks in the food processor; pulse several times to roughly chop. Remove and set aside. Heat the butter and olive oil in a large sauté pan using medium heat. Cook the shallots a couple minutes to soften – don’t let them get brown. Stir in the chopped red peppers, then cover the pan and reduce the heat to low. After 30 minutes, the peppers will be soft and “sweated”. Remove the lid from the pan and increase the heat slightly. Add the white wine (if you are using it) and stir unti the liquid is mostly evaporated (2 minutes). Add the chicken stock and simmer until reduced by half, about 5 minutes. Put all of this shallot-pepper-stock mixture into the work bowl of the food processor, add the lemon juice and salt and pepper, and add the reserved roasted red peppers and garlic. Process about 40 seconds, until the mixture is well blended. Taste and adjust seasonings accordingly. This was a lot more work than I signed up for! I didn’t read the recipe carefully enough before I started. But it is a very, very good sauce. 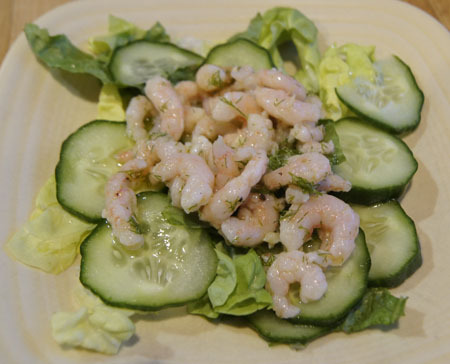 So far I’ve just eaten it on celery – it would also be good on sandwiches but we are on a two-week no-carb stint. But this sauce/relish should keep a week or so in the refrigerator, and I will look for a chicken dish to use it on.